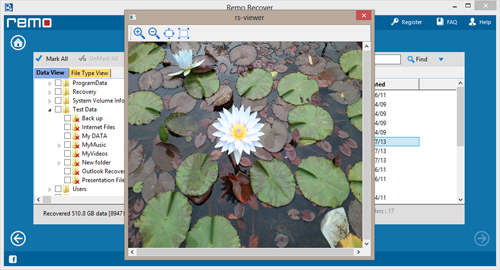 Supports restoration of all formats of pictures, videos, documents, songs etc. The file system is displayed as "RAW"
Windows might ask to format the drive, such as displaying a message "disk not formatted. Do you want to format now?" When you encounter any of the above-mentioned problems, you become unable to access the partitions with the RAW file system, and the data such as documents, photos, videos, etc. saved on them, become inaccessible. When you search on the internet to find a solution to rectify the RAW partition problem, the answer you will get is the format. But formatting the drive will leave you at a total loss. In this case, you will need a recovery tool that can comfortably recover the Windows RAW partition data. The most recommended tool for the above mentioned task is Windows RAW partition recovery software. Whatever may be the reason for the RAW partition problem, the data can be restored. First of all, as soon as you encounter a RAW partition problem, you should immediately stop using the computer and leave it idle. Do not try to perform any kind of task on it, like saving or deleting files, formatting etc. This will keep the files from a RAW partition in a recoverable state by avoiding overwriting, until the recovery is performed. Once the files get overwritten, there is no software available which can recover RAW partition Windows OS. 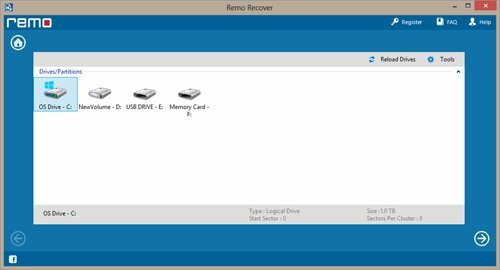 The Windows RAW partition recovery software is extremely easy to operate and even a normal home user can recover Windows 10 partition data as well as Windows 7, Windows 8, Windows10, XP and Vista with a great ease. The tool has many advanced features which makes the recovery process customized. To know the tool’s capability, just download the demo version and try it for recovery. If the results are satisfying then one can buy the full version to save the recovered data from the RAW Windows partition. To get back data from an inaccessible hard drive, visit www.windowsrecoverysoftware.net/inaccessible-external-hard-drive.html for a detailed recovery procedure. 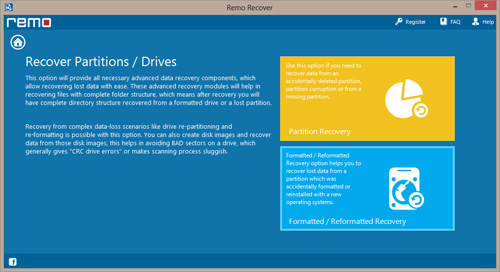 Step 1: From the main screen select "Recover Drives" option and then select the "Partition Recovery" option.